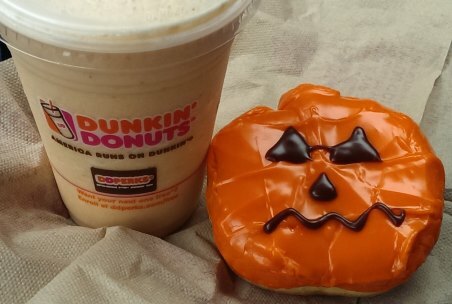 Disclaimer: On Sept 3rd, DD announced a pumpkin COFFEE coolatta. However, this week they started advertising a pumpkin PIE coolatta. Is it possible I got the wrong thing? It certainly didnt smell like coffee, plus it's not dark like the coffee version either. Maybe I got everything but the squirt of pumpkin (though I did see something orange in my cup before it was mixed). Whatever happened, take this angry review with a grain of salt. [New for Fall 2014] Sorry to start this with the shocking headline, but this thing smells and tastes like a wet cigarette. I just don't know how else to describe the shocking spice imbalance in this thing. Ugg, just forced sip number three, this stuff is terrible. with crunchy graham crumbles mixed in"
So how did I get here? How did skeptical, pumpkin spice fearing me manage to shell out a few bucks for this disaster? Well, I blame Talenti really. I've still got their excellent pumpkin pie gelato on my mind, and then I was remembering that the Einstein Bros frozen pumpkin drink and then somehow I just needed to have it [the stench is distracting me while I try to type]. You can see the pumpkin puree bits and some graham bits, but all I smell is spices, spices and more spices. What am I suppose to do with this think? When it first hits your taste buds, it's not that bad, there's a fair amount of sweetness to it, but way too many spices kick in. Why did they do this too me? Why have I been bestowed another terrible coolatta?? That's it, forget it, this one is going down the drain. I refuse to subject my tastebuds (and my nose) to this travesty. Avoid this at all costs. How the pumpkin shaped donut taste like? 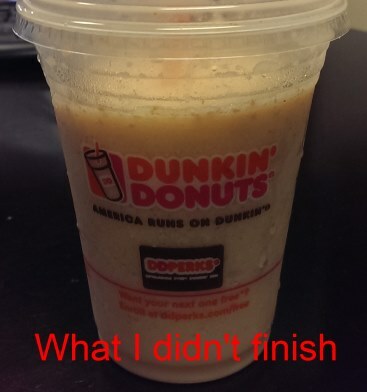 I have never ordered a drink at Dunkin' Donuts, so I do not know how it runs. Is it possible that the worker who made it for you made it incorrectly? @Anon: the donut was good, I inhaled it quickly. it had that sweet white cream inside (as opposed to their boston cream filling). @stride: it is possible, but I don't think it was. when I had the bad oreo experience, it made sense that it was too much cream, but here, even if they put in too much pumpkin flavor, the spices still should have been balanced to some degree and they weren't. The pumpkin flavored craze really doesn't work for a lot of products. That is kind of an angry looking doughnut. @Megan: thank you for the input. I just looked it up and at the beginning of sept, they had a pumpkin COFFEE coolatta. however, this week i started hearing advertisements for the pumpkin PIE coolatta. [review updated]. Since you've enjoyed yours, could you describe the flavor to me? I just got this same thing with my daughter last night. I thought "Pumpkin Pie....I LOVE Pumpkin Pie. This HAS to be good." Sooooo not the case. 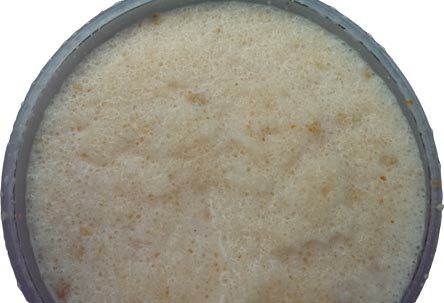 This was the color texture and almost aroma, of baby food. I didn't get past 3 sips of that Reaper Vomit before chucking it out the window. It was the taste equivalent of seeing the Green Lantern movie for the first time. All kinds of anticipation and excitement, only to be left wanting to purge yourself of the entire experience. thanks for the comment. Unfortunately I drove off before really settling in to the review (plus I'm very shy about returning things especially if at first I think I am being too picky). I have been trying to work up the nerve to try this again, maybe sometime soon! Oh my gosh! Thank you so much for this. I have been looking everywhere for other people to agree with me on how AWFUL this drink is. It was so bad I almost vomited. It leaves the taste of bile in your mouth, and I agree with you on the wet cigarette part as well. SO TERRIBLY BAD!!!! Wish I had read this before I wasted my free drink coupon on one. Disgusting! It's so bad I would bring it back if I weren't so far away.